A break from 68 Days of Gourmet to recap my fun-filled culinary weekend in Atlanta! Several months ago we bought tickets to see Muse and Silversun Pickups in Atlanta. We decided that since we knew so far ahead of time that we were going to be in Atlanta that we should make reservations to eat at Woodfire Grill. 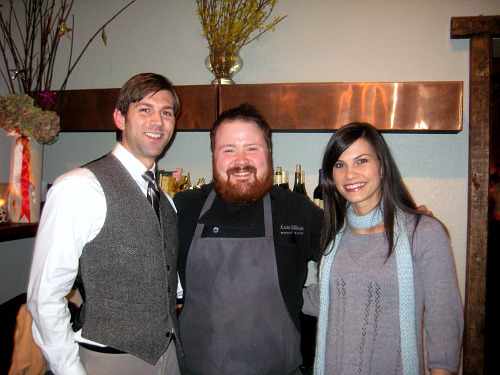 It’s the restaurant where Top Chef contestant Kevin Gillespie is co-owner and executive chef. My parents moved to Atlanta last year and when I visited last summer they took me to Woodfire for dinner. I came home and told Brandon it was one of my top five meals ever and couldn’t wait to take him there. I was so surprised and excited to see last fall that Kevin was a contestant on Top Chef. We watched and rooted him on all season. Even though he didn’t win in the end, I think it’s fair to say that he’s the true winner in all the fan’s hearts! So needless to say, since Kevin enjoyed great success on Top Chef, it’s next to impossible to get a reservation at Woodfire – especially on the weekends. We made our reservations three months in advance! Our dinner was phenomenal – the food and service was truly outstanding. We were greeted right when we walked in the door and shown to our table. I was excited to find that I had a view of the open kitchen. Our server was extremely knowledgable and friendly and made some great wine suggestions over the course of the night. We chose to do the five-course chef’s tasting dinner. Kevin had decided to go with a Southern theme for the tasting so all of our dishes had a little bit of a down-home feel. A very quick overview of what we remember from the courses (I should have taken notes – and FYI – Brandon forbid me to take pictures). Pork belly, slice of pork tenderloin with some sort of vegetable hash. I’m fuzzy on the details here but the pork belly was delicious! And I’m sure you’re thinking this post is over now but no…I have more for you! 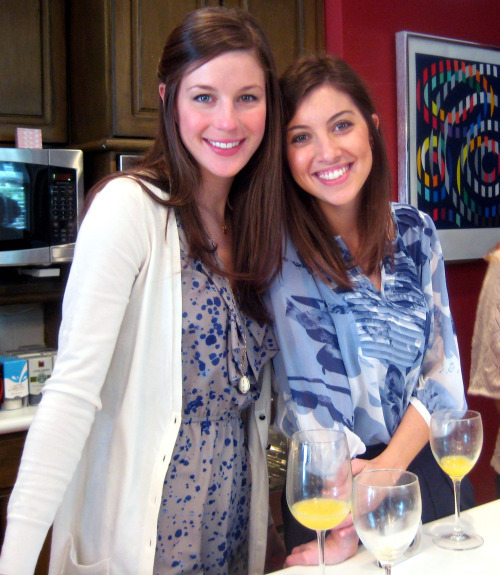 My friend Michelle ended up having a kitchen shower the same weekend in Atlanta. Love when things work out like that! When I arrived at the shower I was so surprised to learn we were having a cooking demonstration! So up my alley! 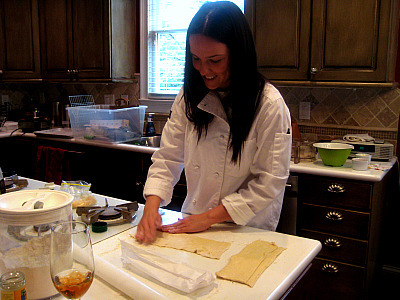 The shower hostess hired Chef Natalie Vallo to demonstrate brunch-themed dishes for us. She demoed mini quiches (recipe and picture below), savory palmiers and bistro mustard vinaigrette. It was such a nice change of pace from your typical shower and I loved that Chef Natalie focused on seasonal, sustainable ingredients. If you live in the Atlanta area you should definitely check out her website! She offers all kinds of services ranging from personal chef to special needs diets to cooking demonstrations. So if you’ve made it to the end of this marathon post, I reward you with the recipe for mini quiches that Chef Natalie made for us Saturday! Sure to be a hit at any brunch! Add flour, frozen cut butter and salt to bowl of large food processor (at least 9-cup). Hold down and pulse for 10 seconds. Add the 3 tablespoons of ice water and hold down and pulse for 7 seconds. Mixture should resemble cornmeal so if it does at this point move to the next step. If not, add water one tablespoon at a time and pulse for 3 second intervals until you get the cornmeal texture. Be very careful not to overwork the dough. Gather dough and wrap in plastic wrap for at least 2 hours. Roll out and use as needed. 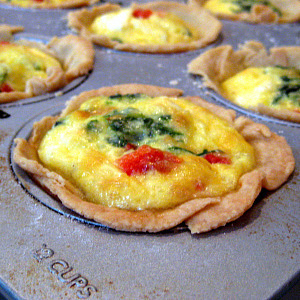 For mini quiches you should be able to fill 12 muffin tins with one pie crust recipe. You will want to prebake the crust a little for the quiches. Poke holes in the bottom of the crust in tins and line with parchment paper and fill with dry beans. Bake at 375 degrees until crust appears pale and dry, about 10 minutes. Combine everything from egg through pepper in a large bowl and whisk until smooth. Place quiche filling the the bottom of the prebaked crusts and pour egg mixture over filling until about 2/3 full. Place the muffin tin on a baking sheet before placing in the oven. Bake for 375 degrees until quiche is set, about 15-20 minutes. Quiche should be about the consistency of jello when you shake. Let cool for at least 20 minutes at room temperature – it will finish cooking. So jealous of all of this… Kevin, Muse and Silversun Pickups! That is an awesome shower idea. Glad you had a good time and the bride-to-be… so excited for her! What a fun weekend! And I love the shower idea! Can’t wait to try out these mini-quiches!